September 25, 1990- Bethesda opens youth center. The 1990’s were a time of significant growth for the Mission as the desire to continue adapting with the shifting needs of the community took on different forms. 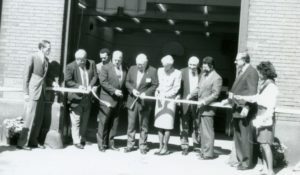 1990 marked the opening of Bethesda Mission’s Youth Center – a direct response to the growing needs of inner-city youth. The Mission purchased the old Shamrock Fire Station on 15th and Herr Streets from the local Mennonite Conference for $35,000 to restart its youth ministry.